Bradford freshman Austy Miller led the Railroaders with 19 points in defeating Mississinawa Valley 60-34 on Thursday. 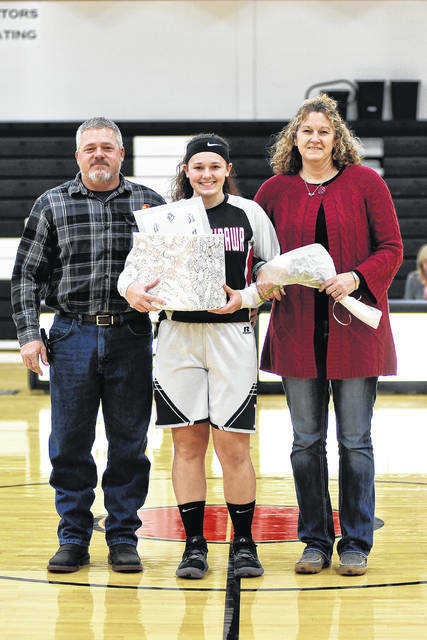 Sidnie Hunt was one of three Mississinawa Valley seniors recognized on Senior Night Thursday. 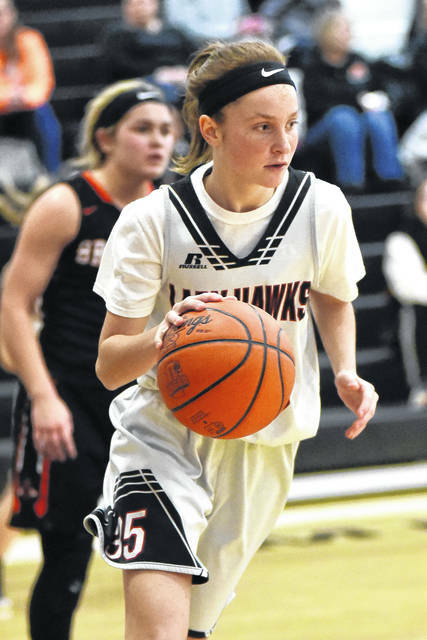 She led the Lady ‘Hawks with 11 points in a 60-34 loss to Bradford. 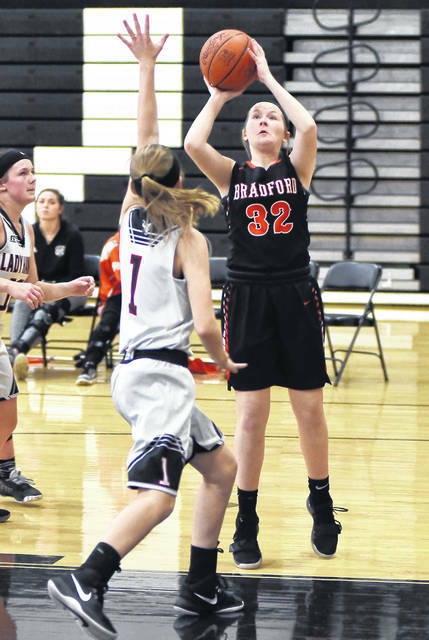 Bailey Johnson shoots a free throw during a Cross County Conference loss to Bradford on Thursday. Johnson was one of three seniors recognized on Senior Night for the Blackhawks. Bradford senior Bianca Keener goes up for a score during a Cross County Conference contest at Mississinawa Valley on Thursday. The Railroaders won the game, 60-34. 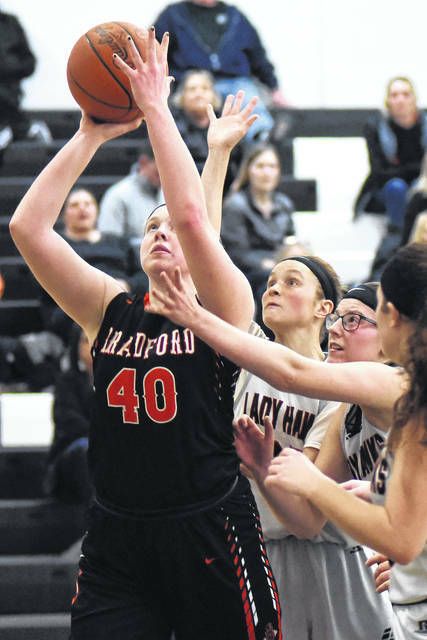 Bradford’s Cassi Mead fights for a rebound with Mississinawa Valley’s Taylor Stachler during a Cross County Conference contest on Thursday. The Railroaders won the game, 60-34. 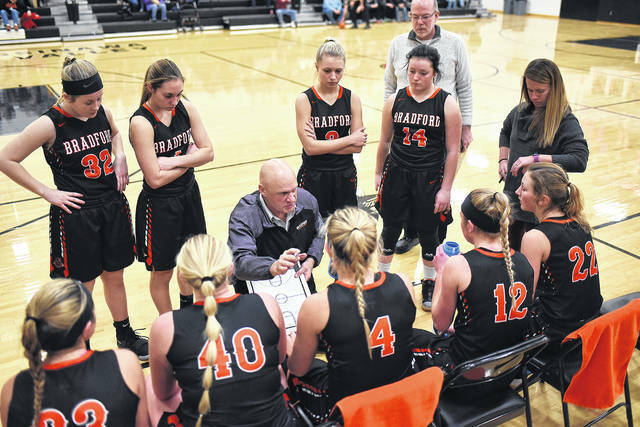 Bradford coach Chris Besecker talks to his players during a timeout in a Cross County Conference game at Mississinawa Valley on Thursday. The Railroaders won the game, 60-34. Mississinawa Valley coach Michael Paige talks to his players during a timeout in a Cross County Conference game against Bradford on Thursday. The Railroaders won the game, 60-34. Mississinawa Valley senior Bailey Johnson is pictured with her parents Nathan and Jacqui during Senior Night festivities on Thursday. 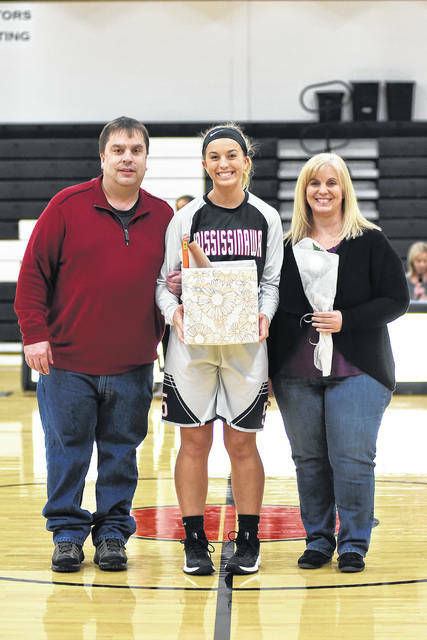 Mississinawa Valley senior Olivia Murphy is pictured with her parents Todd and Beth during Senior Night festivities on Thursday. 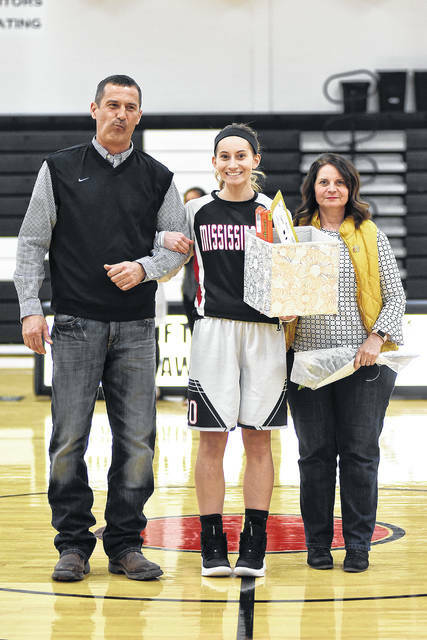 Mississinawa Valley senior Sidnie Hunt is pictured with her parents Wade and Billie during Senior Night festivities on Thursday. 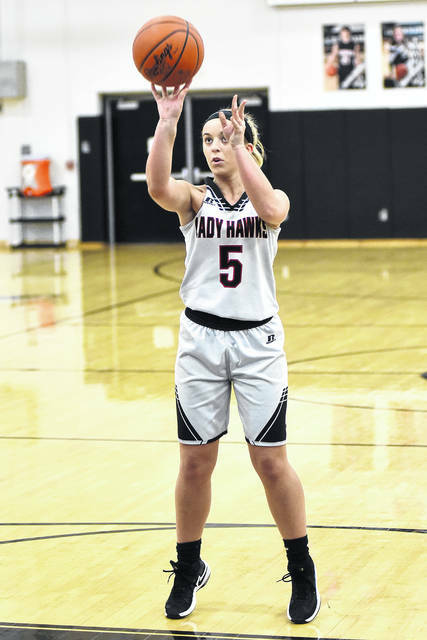 Bradford’s Karissa Weldy takes a jump shot during a Cross County Conference game at Mississinawa Valley on Thursday. The Railroaders won the game, 60-34. Mississinawa Valley freshman Mattie Hiestand drives toward the basket during a Cross County Conference game against Bradford on Thursday. The Railroaders won the game, 60-34. Bradford’s Rylee Canan (22) tries to score with Mississinawa Valley senior Olivia Murphy (20) on defense during a Cross County Conference game on Thursday. The Railroaders won the game, 60-34. 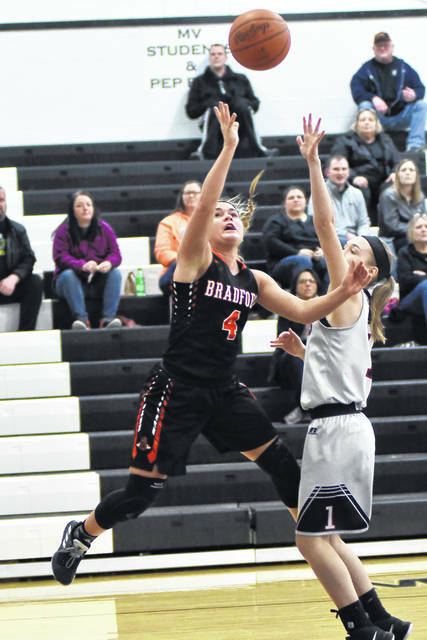 UNION CITY – A strong third quarter push by Bradford was enough to spur a 60-34 win over Mississinawa Valley on senior night. The ’Hawks recognized three seniors prior to the game – Bailey Johnson, Olivia Murphy and Sidnie Hunt. Hunt and Murphy both scored early to give MV a 6-2 lead, but the home team would go cold after that and Bradford took an 11-6 lead after one quarter of play. “We missed some opportunities early in this game, give credit to Mississinawa they took advantage,” Bradford coach Chris Besecker said on the first quarter start. Sophomore Taylor Stachler, who had 6 points for Mississinawa in the second quarter, got the ’Hawks to within a bucket early in the frame, but the Railroaders were able to get back on track to take a 25-14 lead at the break. 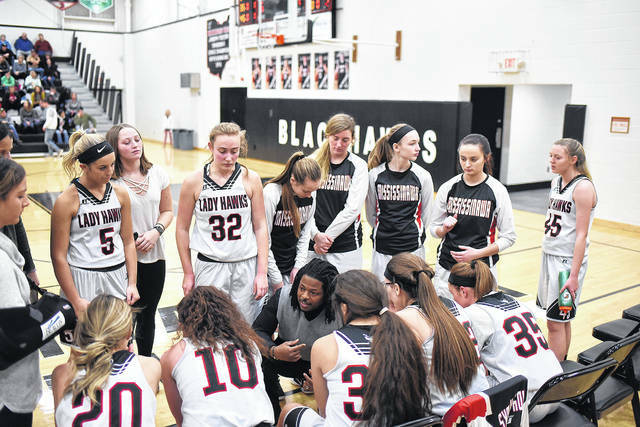 “We came out hard tonight despite missing practices and having girls sick, we’re down a couple of girls, playing some younger girls, but our effort to start was pretty good,” Mississinawa coach Michael Paige said. 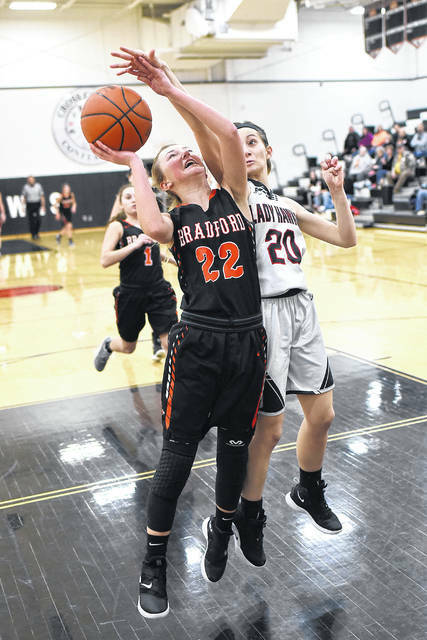 It was a strong push by Bradford in the third quarter spawned by full court pressure and a breakout quarter by Austy Miller, who had 15 of her game-high 19 points in that span that helped push the ’Roaders lead to 50-24. 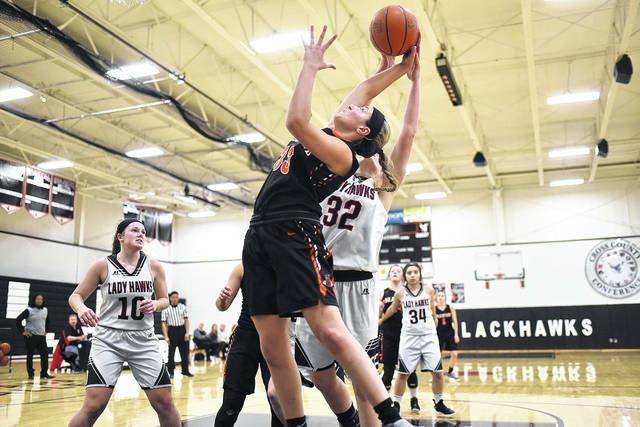 “We started out in the second half doing a little pressing to try and get us going and it worked as we got a little bigger gap on the scoreboard and the press did what it was supposed to do giving us a 20-something lead,” Besecker stated. 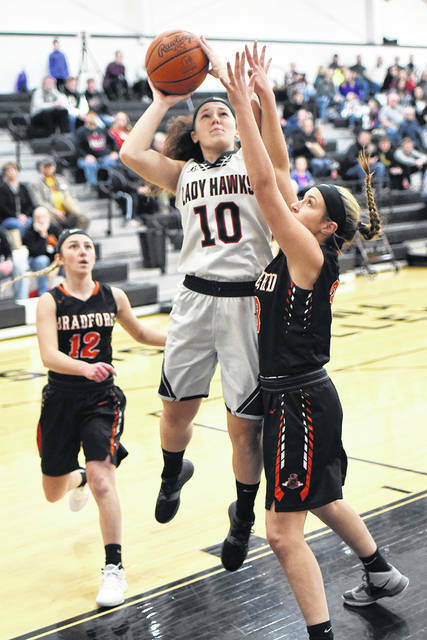 In the final stanza, Bianca Keener scored 6 of her 12 points for Bradford, while Sidnie Hunt had 4 of her team-high 11 points along with 12 rebounds for the ‘Hawks. There was no catching up to Bradford, who went on to win the game 60-34. The Railroaders were led by Miller with 19 points, Keener with 12 and Emma Canan had 11. Bradford improves to 13-6 overall and 6-5 in the Cross County Conference. Mississinawa Valley was led by Hunt with 11 points and Stachler with 10. They fall to 1-16 overall and 0-10 in the conference. Despite just one win this year, Paige is pleased with the progress his team has made. “We’ve been improving and our last game with Ansonia it showed, we played really well before falling at the end,” Paige commented. “Tonight, we were off a bit with everyone being up and down, but considering where we were at the beginning of the year, we’ve made huge strides offensively in finding open lanes, understanding when someone is open and when they’re not,” Paige added. Paige took the time to reflect on his three seniors and acknowledged they will be hard to replace with the youth they have on the squad coming back. “Sidnie Hunt is one of the hardest workers I’ve ever coached. She is averaging 10 rebounds a game and is a leader on the floor by example all the time. Olivia Murphy just works hard all day long and will give you everything she has, and Bailey Johnson has been our emotional leader, is always positive and telling kids to keep their head up and doing the right things,” Paige concluded. Bradford – Hill 2, A. Miller 19, E. Canan 11, Fike 4, R. Canan 6, Mead 6, Keener 12. Totals 1-22-13/18 – 60. Mississinawa – Johnson 2, Hunt 11, Murphy 3, Lavy 4, T. Stachler 10, Caixba 2, Reichard 2. Totals 0-15-4/6 – 34.